Attending high school in Central California, Contreras had good grades and an interest in math, but no plans for attending college. However, following a friend’s example, he submitted several applications, and was accepted at CSULB. Upon arriving on campus in 2014, he joined the Beach Engineering Student Success Team (BESST), which provides a cohort experience and supplemental tutoring. 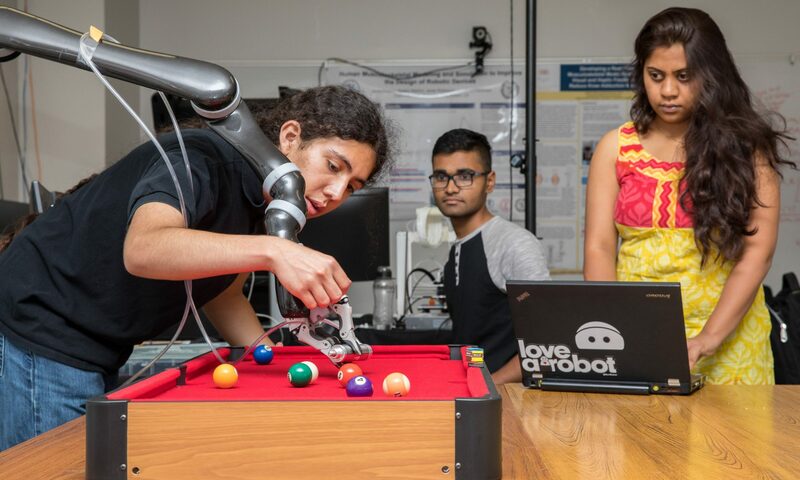 The following year, Contreras joined BUILD, working in Professor Panadda Marayong’s Robotics & Interactive Systems Engineering Lab, where he manufactured a rehab device for amputees and worked on algorithms and motion-analysis methods. His research led to two conference publications. During his years at CSULB, Contreras received Boeing, Alice and J.P. Wang, and College of Engineering scholarships, and has frequently made the President’s and Dean’s lists. Contreras was named the CSULB College Assistance Migrant Program’s Student of the Year in 2017. He’s also been eager to help others, working as a mechanical engineering tutor, and as a peer mentor for BESST and CAMP. Contreras credits his mother, Rosa, an agricultural worker, for inspiring him to work hard. In 2017, Contreras completed a summer internship at the Shirley Ryan Ability Lab at Northwestern University. Last summer, he worked on a four-limbed robot while completing an internship at MIT’s D’Arbeloff Lab. He’s currently working as a year-round intern at JPL’s Mobility and Robotic Systems Group designing components of hybrid ground-aerial vehicles for the DARPA SubT Robotics Challenge. The Outstanding Graduate Awards reward individuals who have distinguished themselves academically and demonstrated service and dedication in national, local, and campus organizations. They will be recognized at the 2019 Alumni Awards on Thursday, May 9 at the Hyatt Regency Long Beach.